It's hard to see the hype for the upcoming Godzilla: King of Monsters without getting excited, though the past few days my focus has been mostly on Ghidorah. There's badass and then there's King Ghidorah level badass. 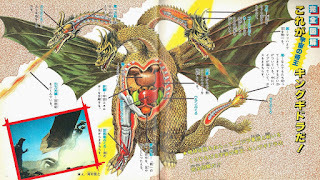 Depending on the movie, Ghidorah's orgin's change, though I'm mostly fond of his space alien roots from the Showa era. There's something special to a monster from outer space who's based on a hybrid of the Hydra and Orochi who's purpose is to destroy.